Ever heard of a ghost crab? Goblin shark? Vampire squid? Yep, they’re all REAL sea creatures who happen to be named after unreal Halloween monsters! How fun is that!? We’re so excited to share with you our brand new coloring sheets that go along with the Shalloween theme! As many of you may remember, Shalloween is an undersea Halloween party in the moonlit ocean shallows. We wrote and illustrated Shalloween (our 2nd children’s book) to celebrate the REAL ocean creatures who are named after Halloween monsters. 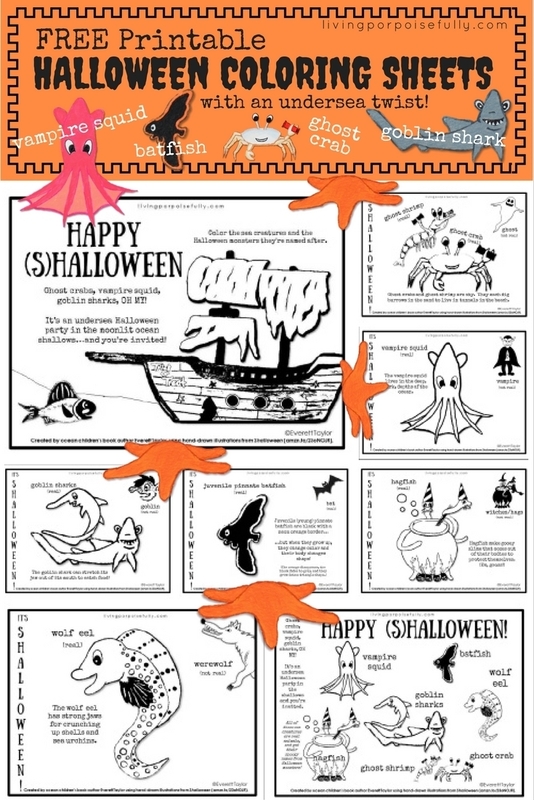 Each coloring page features the real sea creature (and an educational fun fact) along with the Halloween monster it’s named after. Scroll down to save/print the pages and have a HAPPY (S)HALLOWEEN!